The University of Dayton took it upon themselves to see how much damage drones could have on an airplane. Drone safety is no joking matter. Every drone pilot should take it seriously, because the damage drones have the ability to cause is crazy. The damage drones can cause close to the ground is one thing. Hitting a car, truck, bike rider, or pedestrian can cause serious injury or death. But until now, we didn’t have a visual on the effects of a drone hitting a plane. 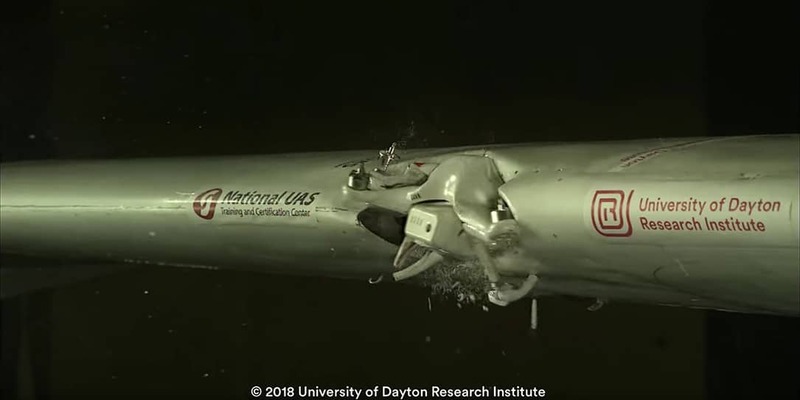 The University of Dayton Research Institute took it upon themselves to see how much damage drones could have on an airplane. Their research resulted in the eye-opening video below. Tests performed at the University of Dayton Research Institute’s Impact Physics Lab show that even small drones pose a risk to manned aircraft. The research was a comparative study between a bird strike and a drone strike on an aircraft wing, using a drone similar in weight to many hobby drones and a wing selected to represent a leading edge structure of a commercial transport aircraft. The drone and gel bird were the same weight and were launched at rates designed to reflect the relative combined speed of a fully intact drone traveling toward a commercial transport aircraft moving at high approach speed. I love drones just as much as any drone hobbyist but the drone community has a huge responsibility to fly safely — not to mention laws to abide by. The damage from drones could cause a major accident and result in catastrophe. I’m not sure anyone would want such a thing on their conscious. The University of Dayton Research Institute has an excellent blog post on their research and more information for you to read, so check it out. If you’re a drone pilot and have friends that are pilots, please share this article with them so they can see this video. It really should serve as a reminder, and maybe an eye-opener, for some who might be flippant about safety. What do you think of this video? Have you ever flown your drone unsafely? Do you know someone who does? Let us know in the comments below or on Google+, Twitter, or Facebook. You can also comment on our MeWe page by joining the MeWe social network. *Video used with permission from University of Dayton Research Institute. What was the most popular Netflix show in your state?